Chronic Vein Disorders (CVDs) are common problems caused by venous hypertension, most often in the legs. There are many different options for treatments of this type of disorder. Treatment options include conservative management approaches or total elimination of these dysfunctional vein pathways with endovenous (inside the vein) techniques or surgery. 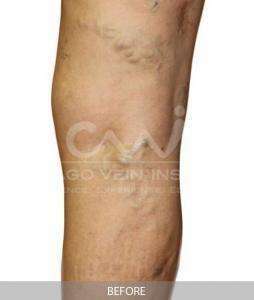 You can see here what an issue with varicose veins looks like before treatment by Endovenous Laser Ablation. If your veins look similar, you should get in touch with Chicago Vein Institute to seek treatment. EVLA™ is a minimally invasive, FDA approved treatment for insufficient varicose veins. Under local anesthesia and with the assistance of ultrasound, a laser catheter is inserted into the saphenous vein through a tiny (1-2 mm) opening. The laser is slowly heated and seals the damaged vein as the catheter is withdrawn. The procedure takes about 45 minutes and leaves no visible scars. Chicago Vein Institute performs over 1,000 EVLAs annually.